All Star Chevrolet Blog | Part of the Largest Automotive Group in Louisiana, All Star Automotive Group Serving the Baton Rouge, LA area since 1987. 11 stores, 14 manufactures & 5 convenient Collision Centers. All Star Chevrolet’s Monthly Specials! It’s a New Year! Let’s switch gears and hop into a new ride! We have some amazing offers and deals at All Star Chevrolet on the corner of Sherwood and Airline! We want you to come and take advantage of these great savings! Get the tough jobs done in a brand new 2018 Chevrolet Silverado 1500 LT Crew Cab Texas Edtion! We are offering $11,500 off of the MSRP! There is nothing better than an All Star Edition truck! We are offering $13,170 off the MSRP of the 2017 Silverado 1500 LT DBL CAB! In the market for something the whole family can enjoy? Well look no further, than the all-new, redesigned 2018 Chevrolet Equinox! This vehicle checks every box on the list for only $22,970! We also have up to $6,000 off of the MSRP on all remaining new 2017 Chevrolet Tahoes! This is one classy SUV that will enamor you just in time for Valentine’s Day! Hurry in to All Star Chevrolet today to take advantage of these amazing deals! Every new Chevrolet includes 2 years or 24,00 miles of complimentary maintenance! All Star Chevrolet is a proud member of the All Star Automotive Group, and carries the Chevrolet line of products; which are some of the most reliable and dependable vehicles in the world. We serve the Baton Rouge, Denham Springs, Prairieville, Gonzales, Shenandoah and surrounding areas. If you are in the market for a Chevrolet, come by our Dealership at 11377 Airline Hwy in Baton Rouge and experience Sales, Parts, Service and Collision that is really All Star! Let our team at All Star Chevrolet help you find just what you are looking for! We have a large selection of new and used vehicles to choose from. There is something for everyone. Click here to see our inventory! Our staff is qualified and able to assist you with any vehicle needs, concerns or questions you might have. We assure you that you will not be disappointed in our team! Come on over to All Star Chevrolet to receive All-Star service! All Star Chevrolet Gets Another 5-Star Review! Here at All Star Chevrolet we pride ourselves on excellent customer service! It’s our number one priority to ensure that every customer that walks through our door or visits http://www.allstarchevroletbatonrouge.com/, is satisfied. The All Star Treatment GUARANTEES our customers that we are 100% committed to your satisfaction before, during and after the sale. We always love getting reviews and recommendations from happy customers and whenever we receive a review that especially stands out, we like to highlight it. This week, we’d like to share a 5-star review from a very satisfied customer of All Star Chevrolet! Happy Holidays From All Star Chevrolet! The holiday season is in full effect this year! We are so grateful for the wonderful community we serve! This year has been nothing short of amazing for us, and we only have you to thank for that! We are so thankful for your continued support and business that you have given us over the decades. The entire All Star Chevrolet team would like to wish you and your family a Happy Holiday! We hope this holiday season is filled with lots of joy for you and your loved ones! We ask you spread the holiday cheer this season, and spend this magical time of year with your loved ones! All Star Chevrolet is proud to help you find that perfect vehicle for that special someone in your life! Please stop by during our open business hours, and drive away in a new vehicle! Happy Holidays from the All Star Chevrolet team! Living in South Louisiana we always seem to neglect our “winter” vehicle care. But the truth is, no matter where you live, we always need to be aware of how to care properly for our vehicle. We have gathered a few winter vehicle tips to help keep your car at its best! These are just some winter vehicles tips to help keep your vehicle in top shape. These tips are useful when you are visiting family this holiday season in colder climates. Knowing how to care properly for your vehicle on the road could be life-saving! Schedule your service appointment with us today! Never had a problem over the years with ALL STAR , they have always given top notch service !! Are you falling in love with fall all over again this season? We sure are! Nothing says fall time than fall festivals. This is the time of year to get outdoors and enjoy the cool crisp air that nature has brought our way. There are countless festivals to attend this fall season, and we have curated a few for you to attend. The epitome of the fall season lies within those giant pumpkins! Go and enjoy an old fashioned hay ride at the Dixie Maze Farms Fest in Shreveport! There will be pumpkin patches, pony rides, fun games, corn mazes and much more! Make this last weekend in October count, by participating in the coolest pumpkin soiree in Louisiana. Visit their website for more information at http://dixiemaze.com/. There is nothing better than some good Cajun food! The Annual French Food Festival is on October 26-29. Go and enjoy one of the best food festivals there is in South Louisiana! There will be Greta Cajun food, music, dancing, and so much more! The admission is free, and it will be held at the Larose Regional Park. Visit their website for more information. http://www.bayoucivicclub.org/features/french-food-fest. Make the last weekend in October a great one! There are plenty of festivals to attend this month, and we definitely want you to be there. Festivals are a great way to get you going for the upcoming holiday season. Get out there, and show your fall spirit! All Star Chevrolet is a proud member of the All Star Automotive Group, and carries the Chevrolet line of products; which are some of the most reliable and dependable vehicles in the world. We serve the Baton Rouge, Denham Springs, Gonzales, Prairieville, and Shenandoah. If you are in the market for a Chevrolet, come by our Dealership at 11377 Airline Hwy in Baton Rouge and experience Sales, Parts, Service and Collision that is really All Star! Had the best experience with the purchase of an awesome 2017 Malibu. The sales people were courteous and really worked with me to ensure everything went smooth, and it did. Would recommend All Star Chevrolet to anyone and everyone. Keep up the good work. The fresh air of autumn has arrived! It has brought all the wonderful fall activities and crafts along! This fall season can be filled with so much warm and joy by doing most of your holiday decorating yourself! What better way to get the fall festivities started by trying someone of these DIY crafts from the All Star Family! Wreaths are the epitome of fall and the upcoming holiday season. There are so many different types that can be made, and morphed to fit your own unique personality. A simple white, rustic, and elegant wreath can be made, or you can really get into the spirit and include the fall traditional colors. Remember there are no rules when it comes to your own design. Make it uniquely yours! Cinnamon, the holiday spice! Let’s put those extra cinnamon sticks to use, and make it into an alluring table piece. This can be done by placing the cinnamon sticks around your favorite candle and holding them into place with some burlap ribbon. Whala! You have a chic, yet warming centerpiece for all of your family gatherings for the fall season. Of course these are just a few things to get you into the season. Once you start with these few crafts, the sky is the limit on all of your falls crafts this season. Creating lasting memories by doing crafts and activities with your loved ones should be cherished by all. Fall is only the beginning of the ending of the year. Let’s all cherish this season by focusing on the small things. Wow, football season has finally arrived! This means that tailgating season is in full effect! The big game is not only a big day for your favorite team, but also a big day for you! This tradition has become equally engaging and intriguing as your football team has. You can make this tailgating season a breeze with a few of the tips below from the All Star Family! Heading out to the football field early with the team? 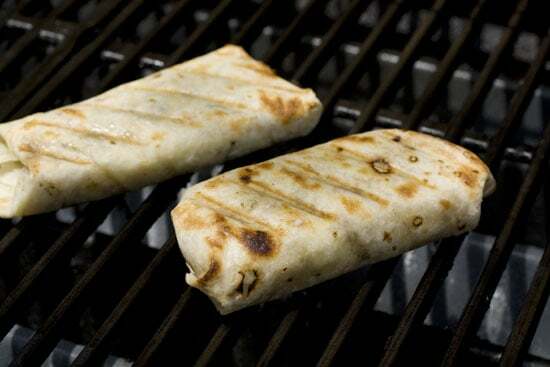 How about making some breakfast burritos on your grill using a cast iron skillet or a griddle. Breakfast can be served while you are finishing up some last minute marinating to those nice cuts of meats. These burritos can be eaten with one hand, while there is a nice cold sports drink in the other to beat the heat. Don’t forget to put the grill marks on the tortillas! Hands out there can get pretty icky and sticky. Try creating a hand-washing station by filling an empty sized laundry detergent container with water. 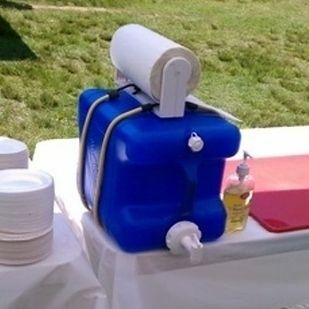 This is a quick way of getting those icky hands washed up! We know that the kids will have their fair share of sticky hands, so putting some kid friendly decorations around this hand-washing station will entice them to use it often. It’s all about the finishing touchdown! Finish your tailgating space in coordination with your favorite team’s colors. You can DIY a football table cloth of a football field. All you will need is a green kitchen rug, white plastic tape, and some numbers from the mailbox section from the store. Take a peak of the finished product below! How can you not win the tailgating contest with decor like this?! Don’t let the pressure of game day get to you! This tailgating season has the opportunity for you to shine on the grill and be the master at clever thinking. We know there can be competition away from the football field, so we encourage you to utilize some of these amazing tips! Let game day be a breeze for you and your guest this tailgating season! The end of summer does not have to start when the school year begins! There are plenty of things to do as the school year goes on. This Labor Day weekend can be filled with so many outdoor activities for you and your family. Leave the work at work, and enjoy some active and peaceful activities this weekend. We have complied a list for some awesome festivities for you and your family! Take full advantage of this fantastic three day weekend and make some of the recommend stops from the All Star Family! Come and explore the brand new Knock Knock Children’s Museum this Labor Day weekend. The museum debuted on August 22nd and you and your family can be among the first to enter the Knock Knock Community! They have 18 hands-on learning zones for the best experience for your kiddos. The Knock Knock space is tailored specifically for kids, so it will definitely keep them intrigued! Did we forget to mention how artistic and wonky the building is? Well this is for sure the spot to be this labor day weekend, if you want to get away from the more traditional approach. The LSU Lakes are always a great option for families who are wanting more of a quiet weekend and away from the hustle and bustle of the city. This silent, and serene location is great to sit back and be one with nature. There you can bike, kayak, and much more. No worries if you do not have the outdoor gear on hand, LSU UREC has all the gear you need for for this relaxing, adventurous spot! Rental gear can be purchased at UREC. This is definitely the spot to be to spend quality time with the family, and the best part is- free admission! As the evening gradually comes to an end, it doesn’t have to necessarily mean you and your family have to. How about stargazing at the Levee this Labor Day weekend. This is an activity that is sort of overlooked by many. Stargazing is a great way of meditating and clearing your mind. Most of all, there are some great things to be seen in our vast universe! This is one activity you will be glad you signed yourself up for! Who knows, you might even see a shooting star to wish upon. Best part yet, this activity is free! As mentioned, there are some fantastic things to get out the house to do this Labor Day weekend. If you enjoy spending quality time with the kids, and learning new things is for you, then we suggest you get out there, and enjoy your long weekend off!